In 1970 Dad was happy with his relocation to Weehawken for tax and rent reasons. As can be seen from the map above, his new home was less than 2 miles from the New York Athletic Club. However, there was just one teensy little problem. He literally could not get there from here. Two miles away, true, is considered generally to be very close. Assuming you can find your car keys, you can cover that distance in less than 5 minutes in most places in America. Except from Weehawken to New York City during dining, drinking, and playing hours. Dad tried, of course, to pop over to his old stomping grounds in Manhattan as usual. And fatigued of it fairly quickly. The traffic and parking turned out to be too much of a nightmare. Thus, I imagine that Dad felt a little cut-off. I am sure that he tried the Irish pub downstairs when he felt like “catting around” but found the local talent to be lacking. He never went there with me or mentioned it to me, ever. So Dad devoted himself to building up his business in late 1970/early 1971 – which was booming – and to finding some real estate to purchase so he could ditch the rental office suite and studio at 974 Boulevard East. He always considered that location to be temporary, anyway. Weehawken oddly enough, did manage to have something of an “estate section” called King’s Bluff. The Palisade Cliffs, which run the length of the New Jersey border with New York City, terminate in a rocky up-cropping there, defining the southern boundary of this residential neighborhood in the center of the township. Facing the view and the waterfront was a stately street called Hamilton Avenue on which five mansions could be found. These three story houses were clustered together fairly tightly, yet managed to have small plots of mowable grass in front, back and on one side. The last two were built in a sort of Ship Captain’s style – meaning large second floor balconies where captain’s wives of yesteryear could see their husband’s ships coming and going. Hamilton Avenue today. No. 19 is a gold brick house behind the three trees in this Google image. Across Hamilton Avenue was the ubiquitous old crumbling uneven sidewalk, a wrought-iron railing, and then the sheer drop of the cliffs down some 300 feet to the abandoned waterfront below. In between the weeds, bags of thrown refuse could be seen here and there. Towards Boulevard East, on the cliff side of Hamilton Avenue, was a neglected and quiet curiosity. A small fenced off monument dedicated to one of the saddest events in American history – the duel between two political antagonists of the early 19th century, Alexander Hamilton (of the $10 bill), a former Secretary of the Treasury, and the sitting Vice President of the United States at the time Aaron Burr. As far as I can tell, Hamilton came to Weehawken only one time – and that was to die. 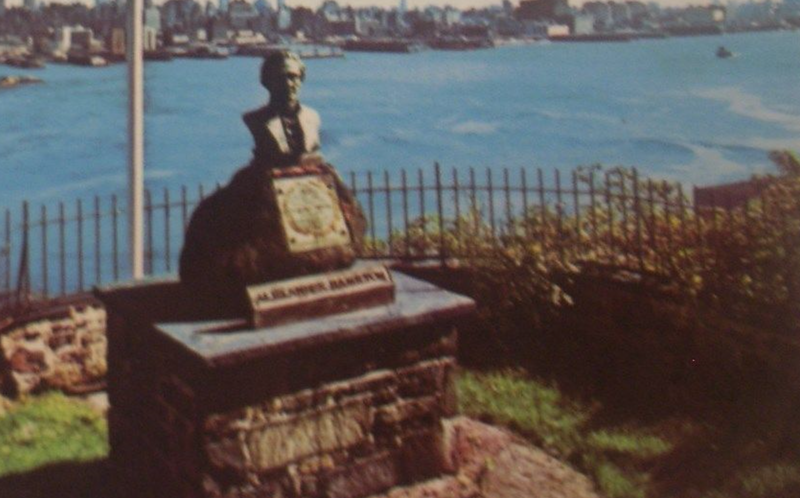 The Alexander Hamilton monument as it appeared in the early 1970s. WHO WAS HAMILTON? A REPUBLICAN? Hamilton was a protégé of President George Washington and a giant of American politics. Among his many accomplishments was the building of a nationwide coalition of elite politicians and bankers that came to be known as the Federalist Party, a forerunner of today’s Republican Party. It was much more akin to the Establishment wing of the Republican Party or “indoor Republicans” than the amalgam of factions that calls itself the GOP today. They supported a strong national government to assume the war-time debts of the states from the Revolutionary War, rapprochement with Great Britain, and taxes on whiskey, land, houses, and slaves. The opponents at the time, led by Thomas Jefferson, called themselves various names like “Democratic-Republicans” or “Republicans,” (among many others) and drew their support from rural areas. For example, they favored closer relations with France, whom they saw as more democratic than the despised British. I have tried to determine if Hamilton would have been fun to hang around with, but it is not easy to learn much about his personal character. He was a gifted writer and scholar, to be sure, and was said to have made jokes about God at the Constitutional Convention. Like Dad, he grew up adjacent to a large Jewish community and even learned Hebrew (Dad similarly knew many choice Yiddish expressions). I suppose if you liked substantive conversation, Hamilton was definitely your man. His enemies however saw him as elitist, aloof, and disparaged him as a monarchist. One such in particular would be his undoing. Previous I CAN’T STOP MY LEG!